��. the First Grade in 1946 at the Old Watkinsville Elementary School. I remember the first day- the small chairs and tables and several friends from Union Church: Louise Dickens, Ann Hill, Mack Caldwell, Harry Thomas et al. My first grade teacher was Mrs. Lockhart, second grade was Mrs. Thomas, third grade was Mrs. McCook and fourth grade was Mrs. Margaret Johnson���.. 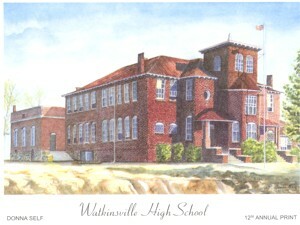 I started to school in the First Grade in 1946 at the Old Watkinsville Elementary School. I remember the first day- the small chairs and tables and several friends from Union Church:Louise Dickens, Ann Hill, Mack Caldwell, Harry Thomas et al. My first grade teacher was Mrs. Lockhart, second grade was Mrs. Thomas, third grade was Mrs. McCook and fourth grade was Mrs. Margaret Johnson. I went through four grades in that same building. The memories of teachers and recesses stand out. We had a ‘little recess’, 15 minutes, at mid morning and a ‘big recess’ at noon. In good weather, we played outside. At one point we had a slide and see saws. 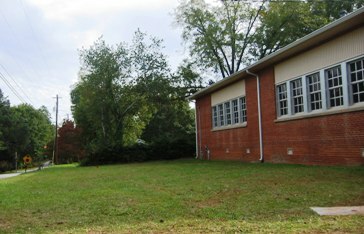 The restrooms were in the “Basement” of the High School Building – boys on the north side and girls on the south side. In the elementary grades (1-4), we played near the “Little Building” (Elementary) and not in the “Big Building” (Middle and High School) area. At the end of recess, we would line up at the door on the side toward the old Gym. One grade would be on the left and another was on the right side. The teachers would write in chalk on the Blackboards. In the early grades, we had chairs and tables .I remember in the First Grade that a little girl beside me would use our scissors to cut things that she wasn’t supposed to. She liked to cut on my shirt sleeves. Later, I came to realize the person was mentally and developmentally challenged. She did not remain in my class very long. In the third grade, I remember the morning my mother told me that Daddy Cliff Dawson had cancer and was going to die. I went to school with that on my mind and was stressed over it. Later in the morning, I decided I had to talk to someone about it and suggested to Mack Caldwell that we go to the “Boys Room”. We were excused and I talked to him about my granddad. When we got back, the teacher was upset with me because someone told her that we planned the restroom break. I think it was the time I was sent to the “Office” – the principal’s office- which was in the front part of the High School Building. The Principal was Mr. Francis Osborn, a large imposing person who spoke in a deep voice. He asked me why I was there. I was so upset and scared that I did not answer him. He asked several times and I can’t remember if I ever answered him. Many of us boys grew up on farms and were physically conditioned and used to outside activity. One of my classmates from First Grade through Twelfth Grade graduation was Cecil Hammond who was bigger than me and many of the other boys. We would play “Horse” at recess in back of the elementary building (now Central Office) on Third St. A smaller boy would ride the back of a bigger person. I was always Cecil’s rider and the two of us were usually successful in pulling our opponents’ rider off. Both of us had the strength of boys who had done farm chores. Four older cousins, Billy, Ned, Edd and Charles Dawson, were ahead of me in School, Billy by eight years and the others by three years. I rode the school bus with them too. In 1947, my brother, Terry Dawson, started in the First Grade at Watkinsville along with our first cousin Patsy Dickens (Now Patsy Barrow Thomas) and later others. Two or three years made a difference in relationships in the lower grades. However, as a smaller boy, older cousins and other High School folks would 'take up' for us. Sometimes, we had Assembly with the whole school in the High School Auditorium but that occurred more often when we were in the Fifth Grade and located in the High School (Big Building). I remember songs, talks by the principal and performances. We students performed on the stage in the auditorium. The stage still exists and is used by OCAF in its exhibit hall. The stage and auditorium hold many memories for me and countless others who attended Watkinsville School. In the fourth grade, Mrs. Johnson’s sister, Mrs. Florine Ward, would come and tell us stories and show pictures. She would talk in character and we gave rapt attention. I heard most of the Uncle Remus stories at that time. Mrs. Margaret would read to us after lunch. I remember a book on “Heidi” and she would read a section each day and it kept our attention. A girl student was in my earlier classes suffered a severe injury. One summer, just before school started, she was hurt in a farm accident and almost lost a foot. She missed weeks and months from school. Another incident happened, when a girl who was in the class one year below mine, fell in the cloak room onto a busted chair. A sharp part of the chair punctured her abdomen area causing serious injury that kept her out of school for a while. She recovered fully and later married and had children. The Old Watkinsville GYM, looking similar now to those days, has many memories. 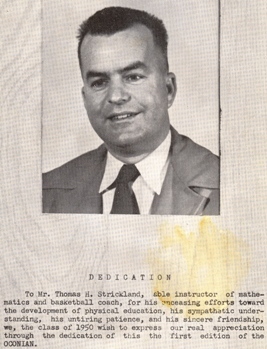 My father played High School Basketball and loved it. He would go to most home games and took us boys and later the girls. Terry and I did not play on the teams. Terry helped some as a “manager” and I was one of the seniors in charge of the Senior Store my senior year. The concession stand funds were dedicated to the Annual Senior Trip to Washington and New York. We had some tense and exciting moments during those ballgames of the forties and early 50s. There was a lot of cheering and hollering and the Old Gym would vibrate – or at least the spectator benches. The Tarpley Boys were outstanding athletes and helped us win Championships. A Tarpley girl also played. The Tarpleys were from High Shoals. I mostly remember Jack Tarpley, who was in the Class of 1950, and Harry Tarpley of the Class of 55. They were excellent players and helped the teams win a lot. I have memories of Coach Tom Strickland staying cool when the crowd would get angry with calls of the officials. 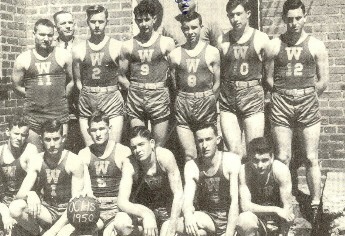 The games were played with area rivals and included Bogart, Statham, and Carnesville among others. The girl’s teams were good too. In my mind’s eye, I can see Mary Jo Shelnutt and Peggy Hardy dribbling the ball to mid-court and really hustling. Lizzie Ruth Willoughby, Alice Hillsman, Margaret Turnbull, Barbara Bell were also good players. 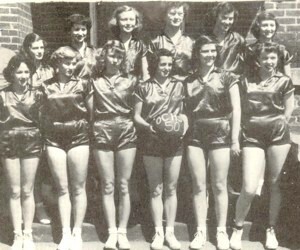 In those days, the girls played either defense or offense and only played half court.